Radnor Fire Company's Auxilary is partnering with Roast & Chop in St. Davids to help raise funds for the fire company. 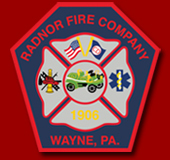 Eat at Roast & Chop, 550 E. Lancaster Avenue, this Saturday between 11 a.m. and 9 p.m. and 50 percent of all sales will be donated to Radnor Fire Company. Be sure to mention RFC at checkout!